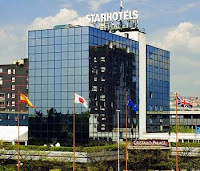 If you are arriving in Bergamo late in the day or have to make an early departure there are plenty of purpose-built hotels handy for the airport at Orio al Serio. And because they are modern buildings, they have sound proofing, air conditioning and many facilities for business travellers. The NH Hotel is less than a kilometre away from Orio al Serio in Via Portici, near the Orio shopping centre. Facilities include a fitness centre, sauna and gym and a restaurant and choice of bars. The NH Hotel is about four kilometres from the centre of Bergamo. Book via this link, or for more information visit www.nh-hotels.com. The Starhotel Cristallo Palace (below, right) in Via Betty Ambiveri is in a good position three kilometres from the airport at Orio al Serio and one kilometre from the railway station in the Città Bassa (lower town). It is a modern building furnished in traditional style inside. The restaurant serves an American-style buffet breakfast and there is a free shuttle bus into Bergamo. Follow this link to book. The UNA Hotel in Via Borgo Palazzo offers either a shower-sauna or hydro massage bath in the bathroom of all of its 86 rooms and has a fitness centre. The restaurant serves both Bergamo specialities and international cuisine. The UNA Hotel is three kilometres from the airport and two kilometres from the railway station. Click here to book, or visit www.unahotels.it for more information.